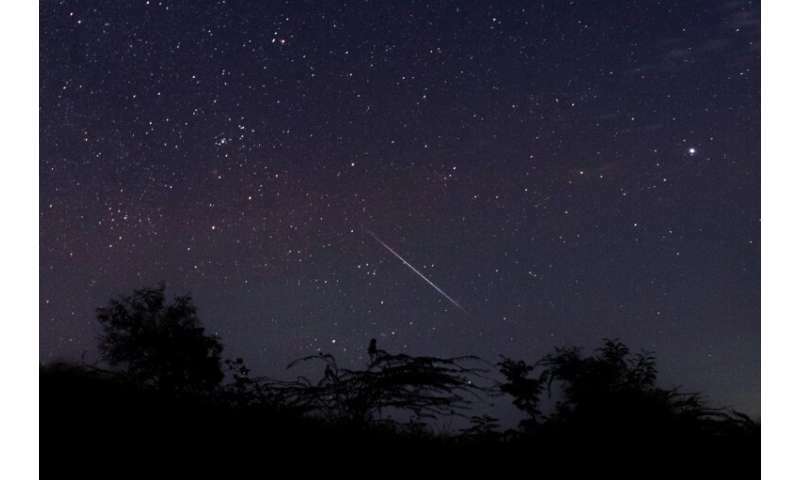 A meteor streaking through the night sky over Myanmar during the Geminid meteor shower on December 14 2018. A meteor is the luminous phenomenon that results when an asteroid or other celestial body enters the Earth's atmosphere. It is commonly called a shooting star. If it does not fully vaporize and some part of it hits the Earth's surface, it is called a meteorite. "Many of them detected the sound waves from this explosion," he told AFP. "If you were directly under it, it would have been deafening." But it was not until March 8 that the Air Force officially informed NASA, which logged the event in the database of fireballs it has kept since 1988, according to Lindley Johnson, NASA's Planetary Defense Officer. "It was almost immediately published on our website, within 10 minutes, I would say," he told AFP. NASA's Center for Near Earth Object Studies calculated the energy released by the explosion to be 173 kilotons, more than 10 times as destructive as the 15-kiloton atomic bomb that leveled Hiroshima in 1945. Proud published the image on his Twitter account: what looks like an orange ball of fire above the clouds and sea, but which is in fact a cloud of dust from the meteor caught in the sunlight, Brown said. As it turns out, NASA's MODIS satellite also photographed the dust cloud, the agency's Kurtis Thome told AFP Tuesday. "It doesn't surprise me," said Patrick Michel, research director and asteroid specialist at the observatory of the Cote d'Azur in southern France. "It is a good reminder that there are a bunch of these things that pass over our heads and that it would be good to be more concerned about them," he told AFP. "It should remind us that even if it is the least likely natural risk we face, it is a still a risk that exists and will in the long term become a reality," he said. "Nothing very unusual," said Rudiger Jehn, head of planetary defense at the European Space Agency (ESA). "We were lucky it was over the ocean. It can happen again, and someday there will be a bigger one," he said, noting that the ESA plans to ask member states for a budget to create a better protection system against asteroids during a ministerial meeting in November. "That meteor explosion is a perfect promotion for our program. And it is free," he said. Funny a meteor explodes with 150 kT of TNT force over Bering Strait and no one sees?! Nome, Alaska just a few miles to the east. And Big Diomede Island eskimo community in Russia's Primorye just s few miles to the west?! In December of all times near Winter Solstice. Just a few years ago...ok a few decades, a hippie WALKED across the ice from Nome to Russia and got there, not knowing he was in Russia. Russians were gonna charge him as Amerikanski spy until they knew how outstandingly worthless as a spy he would have been...then they regurgitated him back to our country to live on our welfare. Ummmm, ever been in Alaska in December? Not a lot of people wandering around in the streets. You don't go outside because you could die if you sprain your ankle. Maybe you'd like to take a trip in reality. Well, what a surprise, you were there desperately seeking man "meat". Another thread, gone to Da Schitts. Why do people have to "pour" over data? Do they not have a program to indicate anomalies automatically? You mean a few thousand miles. Waddyu think godder, they paid all the people in nome to keep their mouths shut? Idiot cranks on this site are reaching critical mass. Mods cower in shelters. Well, i would expect several reasons for the length of time to sort out the evidence. The coverage for that region, the Bering Straits is concentrated on detecting unfriendlies. Not concerned with the random occurrences of infalling space rocks. Yeah, you'd think they should be looking? Wait! Weren't you the one bombasting over the waste of "your" contribution of 12 cents that you paid last year in taxes? As a liberal conspiracy to impoverish you till you couldn't afford that collectors edition of the VG "Trumps Righteous Tweets of Fury"? The one that included a fancy bong? Guaranteed to have been carved from the bones of a SJW by a Democratic Socialist prisoner russian gulag? Oh, you are not that person, Specifically. That you are willing to admit too? Other prob;ems are the sheer quantities of scientific data collected daily. There just are not enough skilled people to check the anomalies & experienced at analyzing the images. They don't work for free! Because you can't write a program to look for something when you don't know what you're looking for. The USAF satellites saw it right away, but the zoomies didn't report it to any civilian agencies for a couple months.